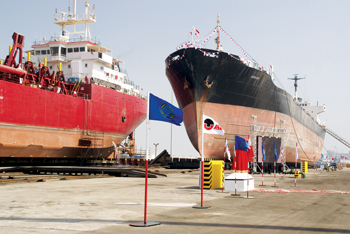 BAHRAIN’S Arab Shipbuilding and Repair Yard (Asry) has highlighted it repaired six vessels simultaneously on its dual slipways, matching a previous record and indicating its small and medium repair business has continued to flourish since the state-of-the-art dual slipways were opened in 2008. The six vessels were four tugs, a hopper dredger and a jack-up rig and they matched a previous record for the number of vessels accommodated simultaneously on the slipways. Vessels in the latest record included the Britoil 64, a tug owned by Britoil Offshore Services, which came for routine drydock hull treatment, crane shaft overhaul and top overhauling of port and starboard engines; the Smit Martinique, a tug owned by Smit Lamnalco having routine drydocking jobs, starboard engine overhaul, and seal renewal of lower gear box; the Al Moayyed 26 and 24, tugs owned by Almoayyed Marine Services in for routine drydocking work; the UDC Blue, a hopper dredger owned by United Dredging Company; and Arabiyah 5 a jack-up rig operated by Saudi Aramco. The twin slipways, each with a dry berth length of 255 m, are ideal for accommodating offshore service boats, large tugs and supply vessels. Their vertical curve design also facilitates new building activities at its upper end, said the report. 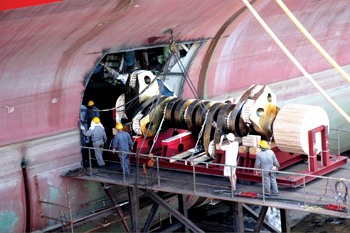 Vessels up to approximately 15,000 dwt, and with drafts up to 4.5 m can be easily slipped up under normal daily tidal conditions. The slipways are equipped with all required shore facilities and are serviced by two 80-tonne crawler cranes. Occupancy at the slipways has risen year on year since then with 2013 revenues attributed directly to slipway work increasing 7.24 per cent over the previous year. Last year the slipways contributed 6.5 per cent of total revenues for the yard.